This will be a one hour service based on the seven last words of Jesus from the cross. Because of the nature of the service, we will leave worship in silence and there will be no time of fellowship after the service. We will continue to rotate the service between churches each year. 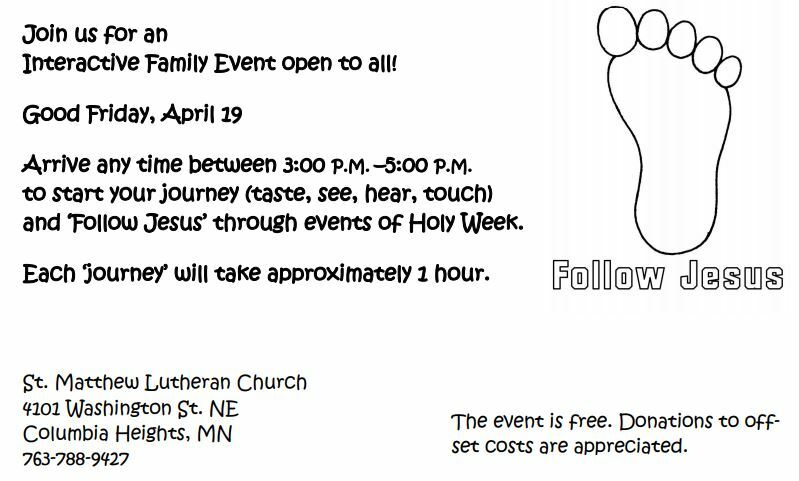 This will be a time of fun and learning for children and adults from St. Matthew and the surrounding community, as we “Follow Jesus” on His journey to the cross and beyond. Arrive anytime between 3:00 and 5:00 to depart on your journey (Journey time, approximately one hour). The solemn Tenebrae service of darkness will be led by the choir, instrumentalists, and readers from our parish community, based on Christ’s seven words from the cross. As we sadly left the darkened church the previous evening, we now joyfully re-enter it – led by the newly-lit Christ candle. We add our cries of “He is risen”, to those raised around the world this night. Holy Communion and your favorite Easter songs will start the celebration! Where was the first Easter Sunrise service? It was at the tomb of Jesus…a cemetery! Think about what that Easter morning event means to every other Christian tomb. It means that they too will one day be empty. Let the events of our Easter morning Sunrise service give you a new outlook when visiting a cemetery. Hillside Cemetery is located at 2610 19th Ave NE, right off of Highway 88. Plan to join us often on this victorious day as we celebrate our risen Lord! The choirs are already hard at work on some glorious Easter music, lilies will abound, and our hymns will be led by the Easter Band. Holy Communion will be celebrated in all services.